This grasshopper looks both wise and foolish, at the same time. These don't look much like the 50's-style girdles but might be like the decorative belts called girdles, worn by gods and goddesses and style-conscious mortals, in a translation of the Odyssey I once read. This juvenile Bocaccio was at Refugio Beach. He was in water only about 8 feet deep, close to the beach. Further out was an enormous school of hundreds of juvenile gopher rockfish, with a few Bocaccio thrown in. I like the way this youngster looks kind of bony, and shows of his outthrust lower jaw. He will be a serious fish when he grows up. 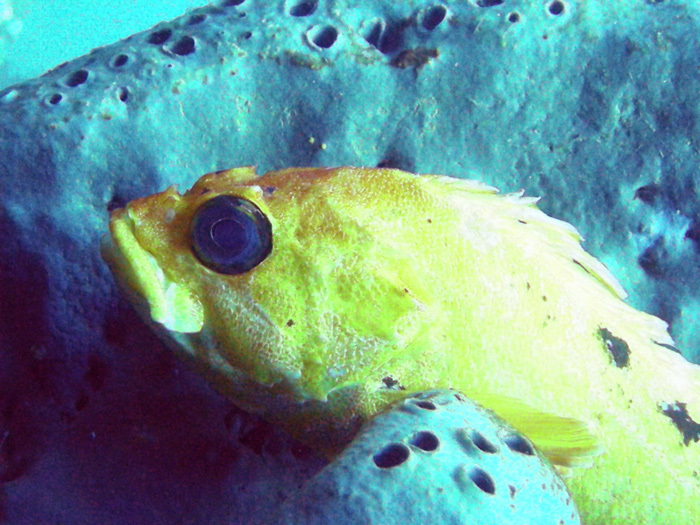 This rockfish was sitting on a moon sponge at about 50 feet on Groovy Wall, off the southeast end of Santa Rosa. It was nearly all bright yellow, with 3 black spots on the upper back and a light dusting of rosy color over the top of its head. According to the experts, it is a xanthic-melanistic color variation of a gopher or black-and-yellow rockfish. Refugio Beach is the most entertaining and accessible cove along the Gaviota Coast -- for both scuba divers and ocean creatures. I learned to beach dive there, but after more than 200 dives at Refugio, I still see something new on every dive. Every day the ocean presents a new episode of its eternal serial drama, in which each scene quickly gives way to another, introducing new actors to meet with the old ones. As I learned to dive, I began to recognize the players on California's ocean stage: sea slugs with electric blue margins and orange tufts, fractal-mouthed burrowing clams, anemones of all sizes and colors, all amidst forests of kelp and meadows of eelgrass. I noticed changes from year to year. A dozen angel sharks assembled beyond the rocky reef, the next year swell sharks gathered, and the next jellyfish flowed through. One year the gray whales migrated near shore, and one surprised me with its blasted exhalation when I surfaced. Lizardfish were common early on; they reappeared only years later. Cormorants zipped past me underwater. A wolf eel moved in for awhile, far south of his typical range. Refugio Beach contains an ever-changing variety of sea life. Over 12 years, I've noticed trends within the many fluctuations: an erosion in the amount of kelp, increases in the area of completely bare reef, and a decline in sizes and numbers of fish. Lobsters-large and common on my first dives-are gone. Urchins are more plentiful, the kelp thinner. Indeed, records and photos from a half-century ago show that kelp is much thinner, and that many fish once plentiful, such as sheepshead, are now gone from Refugio; although they still thrive in the marine reserves in the Channel Islands. We are affecting the ocean -- as we have been for generations -- and we have the power to change it more. We can't ensure the survival of individual ocean creatures, and some species may be beyond recovery; but the ocean has tremendous powers of regeneration. We can set free those powers. This description of Refugio Beach was written for Marc Shargel's upcoming book, "Wonders of the Sea: The Southern California Coast". Ling cod are stealth predators and often lie still, relying upon their camouflage. This nudibranch looks like it's glowing redly from within as it erupts from a blade of red algae. Actually the strobe is shining through the kelp, illuminating an opalescent nudibranch (Hermissenda crassicornis). When the surge passes and the kelp blade turns, the same nudibranch an instant later still looks like it's glowing from within -- but with white light rather than red, from the unfiltered strobe. So it's really that color, right? Well, when not illuminated by the strobe it looks pretty bland, to eyes or cameras. No doubt it looks pretty different to the underwater creatures, who have eyes that see different colors -- when they have eyes at all.